Wondering how to go to Jiufen or Shifen from Taipei city? In this installment of our Taiwan Travel Guide Series, we show you how to go from Taipei to Jiufen to Shifen in one day. Jiufen and Shifen are both places that you should ideally allocate one day each in your itinerary if you have the time. However, if you do not have the luxury of time, here is a quick guide on how to make Jiufen and Shifen a day trip from Taipei. To visit either Jiufen or Shifen, you would have to take a train to Ruifang. You could choose to take buses too but we would not advise doing so as the train is faster and more comfortable. The train ride on an express train from Taipei Rail Station to Ruifang takes only 35 minutes. Getting to Ruifang is easy if you are staying near Taipei Rail Station like we did at Cosmos Hotel Taipei. 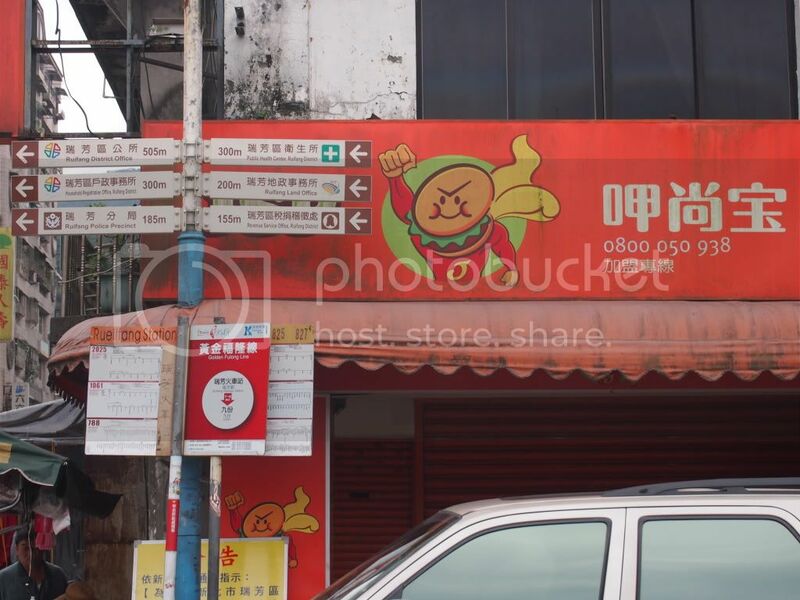 Stay near Taipei Main Station for the best transport options to places in Taipei and other parts of Taiwan. Check out Cosmos Hotel and nearby hotels. You could choose to walk up to the ticket counter on your day of travel to buy a ticket or you could buy it online and pick up the tickets anytime before your date of travel. The advantage of buying in advance is that you are guaranteed a seat. The train ride to Ruifang can get packed if you are traveling on a peak day or during school holidays. Check the monitors to find out the platform to board your train. Train Map of the route from Taipei to Ruifang. Our train was bound for Hualien with a stop at Ruifang. Consider grabbing a bento set and some drinks at TRA Boxed Lunch Store before boarding. Eating is allowed on board but do take your rubbish with you when you alight. When you reach Ruifang (瑞芳), you can choose to go to either Jiufen or Shifen first. In each case, you would still need to come back to Ruifang after your visit to either before continuing to the other. Let’s start with Jiufen first. Follow the sign to the West Exit of Ruifang train station to Jiufen /Jinguashi. You can either take a public bus 1062 or a taxi for the 10 to 15 minutes drive up to Jiufen Old Street. We chose to take a cab at the fixed published price at the taxi stand as we thought the price was reasonable and we did not want to waste time waiting for the bus. If you are headed for Jinguashi, Shifen or Pingxi from Ruifang Train Station, you can take a taxi from this same taxi stand. There will be a long queue of taxis waiting for customers from the early morning onwards. Visitors need not worry about a wait for taxis. To get to Shifen after your visit to Jiufen, take a cab or the public bus back to Ruifang Train Station. Once you are back at Ruifang Train Station, proceed to the ticketing counter to buy a ticket to go to Shifen. We would advise that you buy a one day pass for the Pingxi Line (平溪线) if you intend to visit the various stops along the line besides Shifen. Do note that the train only arrives every hour during the day. Once you get off at a station, you would need to wait for an hour before the next train arrives. Therefore, you need to plan your travel carefully. We had wanted to stop at 3 stations, but have to settle for two (Shifen and Pingxi) due to time constraints. Return train timings back to Ruifang. Do note that the return train ride back to Ruifang from Shifen can be very packed, even on weekdays. We nearly could not board our planned 4.50pm train from Shifen to Ruifang as the train was very crowded. The staff at the train station had to urge the passengers to squeeze so that more could board. As you could imagine, it was an unpleasant ride back to Ruifang. Once you are back at Ruifang, just catch the train back to Taipei Rail Station and you are back at Taipei. For those who prefer convenience over the hassle of public transport, check out KKday’s day tour from Taipei to Yeliu, Jiufen and Shifen. This day tour is inexpensive and gives you time to explore the sights on your own, while providing convenient and reliable transport to and from these sights. We hope you find this article useful in your trip planning. We love to hear from you. Please drop us your comments in the comments box below. Hi, is the ticket from Rufiang to Shifen a one way ticket? Do we need to buy a new ticket from Shifen to Rufiang? If you are buying the one day pass for the Pingxi Line (平溪线), it will cover both ways and any stops on the line. We bought the one day pass on the day itself at Ruifang station. What was the third station you wanted to stop along Pingxi Line? Hi is the cab fare from ruifang to jiu fen based on per person? It was based on per ride, regardless of the number of persons. I believe you can only buy high speed rail ticket to Taipei city from the airport. I am not too sure if other train tickets can be bought at the airport. Alternatively, you might want to buy it online. Hi! What are the stops in the Pingxi Line? The photo of the ticket in our post also shows the stops in Chinese. Glad that you find our post useful. Have a great trip ahead! Hi, can you repost your “Return train timings back to Ruifang”? The image cannot see anymore. thanks. I belive out photo is a bit blur on the station names. Found this on the web. You might want to refer to it for the timings. Hi! How much did you pay for the one-day pass on the Pingxi line? How about the one that just takes us from Ruifang to Shifen? Thanks! We paid TWD $64 for the one day Pingxi pass. We can't remember the price for a ticket from Ruifang to Shifen, but vaguely remember that it is more worth to buy the one day pass sinc you will still need to return from Shifen to Ruifang. HI, may I know how long do you spent time In Jiufen? or should I visit shifen first then only come back to jiufen? if i buy the pingxi line ticket, is it cover to both places? Jiufen is a nice place where you can slowly enjoy it. In our most recent trip, we actually spent a whole day! If you only have one day to visit both Jiufen and Shifen, we would recommend that you visit Jiufen first in the morning so that you can release the sky lanterns @ Shifen around evening. The Pingxi line ticket only covers Shifen. Hi,thanks for your reply. May i know that is it can rush back to station after visit Shifen? I only have one day visit on both places, but most of the time I will at Jiufen because there really is a nice place. May I know take which transportation is better? It will be a bit rush, and the trains on the pingxi line can get a bit packed during the late afternoon. The most comfortable way is of course to consider chartering a cab to visit both places. Thanks for your kindness information, I will look through again and plan for it. HI Tommy, your post is quite informative. Is there is a specified time for the sky lantern in Shifen? There is no specific time to release the sky lanterns. I believe the shops should open by 10 am in the morning. We bought the return tickets online before our trip..
We would recommend to buy the ticket in advance if possible. Hihi i'm currently planning my itinerary and i found that the return train is a local train rather than a express one, and i couldnt find it on the booking site. does that means there no way too book in advance? Thanks! Noted that your departure date is 20 Dec 2017. If I remember correctly, you can only book probably only 2 weeks in advance. Do monitor the site so that you can book when your travel date becomes available for booking online.